One of our original hop beasts of burden makes its whimsically triumphant return. 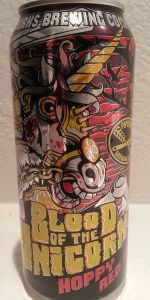 Blood of the Unicorn is Pipeworks Ninja vs Unicorn's hot redheaded sister. Loaded with fruity and piney American hops this rouge equine always delivers. Poured from 16 oz can into pint glass. Dark nut brown appearing, clear; foamy, lasting, beige colored head. Smells of roasted grains, bready/yeast, and mild fresh hops. Tastes of toasted grains, malty, bread yeast, some mineral, with a dry finish. Medium body, medium carbonation, balanced. Overall, fantastic toasted grain and malt flavor (much more a brown ale than a red ale) with a hop balance that makes it more interesting to me than most in this category. Fresh batch from April 18, 2019. The malts here have a much more roasted presence than I'm used to from an amber, but in this case, it works very well--complements the abundant hop character in a way that clearly contrasts with the Ninja vs Unicorn IPA and other related beers in the Pipeworks canon. Appearance: Pours a dark brown, red color that is opaque, but there is a cherry tint with a moderate foamy head. Aroma: Aromas of pine, floral , and tropical fruity hops similar to an IPA is predominant. Nothing else can be appreciated. Flavor: Citrus and tropical melon hop flavors. A strong pine and hop bitterness completely take away the flavor into a dry finish. There is little malt flavor that I can appreciate, however there may be some roasted malt flavor that comes through that is darker and more roastier than your typical IPA. Some roasted caramel. Erased by the bitterness, but it is definitely darker than your typical IPA. Aftertaste/Feel: Well bodied. Good carbonation. A lingering hop bitterness that cleans the palate very dry like a west-coast IPA. Overall: This is a unique beer. The hop bitterness is predominant. It drinks like an west-coast IPA. The malts are darker and more roasted than your typical IPA. It's like a west-coast IPA with a burnt, amber, malt profile. Actually quite delicious. I can understand the respect for this beer with its unique profile. A roasty, west-coast IPA. There's not much else you can say. Why wouldn't someone who likes bitter malts enjoy roasty bittern malts? This is the culmination of the two. Surprised not more have copied this style. Picked-up a single can as part of a mixed six-pack at Kappy's in Norwell for about eleven dollars. Have had a few brews from these guys before. Canned-on on date of 5/18 (thanks Kappy's). Given the age, decent brew, would like to try fresh. 16oz can dated 12/13/18 poured into a pint glass has a dried blood/rusty brown body that floats a persistent cap of cream colored tiny bubbles and leaves stepped erratic lacing. Aromas include flowery and piney hops with a bready, caramel malt. Flavors are more citrus fruit rind, pith, backed by an innocuous malt. Mouthfeel is medium, leaning full, and leaving an almost chewy, sticky residue. Overall it doesn't seem to know what it is, but I didn't pour it out. Fell-good smooth ale, be amazing on a hot day!